The fifth Annual Conference was held on 4 April 2014 for researchers and postgraduate students. Researchers and postgraduate students presented their research work on maritime law and Policy, including relevant interdisciplinary work, attracting a large number of abstract submissions. 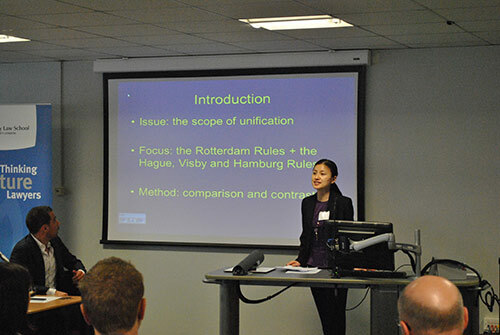 The London Universities Maritime Law and Policy Research Group held the Fourth Annual Maritime Law and Policy Conference for researchers and postgraduate students on Friday 12 April 2013. Researchers and postgraduate students presented their research work on maritime law and Policy, including relevant interdisciplinary work. An article about the event appeared in The Maritime Risk International (page 9). The London Universities Maritime Law and Policy Research Group held the Third Annual Maritime Law and Policy Conference for researchers and postgraduate students. Researchers and postgraduate students presented their research work at this conference in areas of Maritime Law and Policy, including relevant interdisciplinary work. 'Defining' Pool Agreements by Laura Ramil, Intership Navigations Co. Ltd.